Activated Carbon Filter Vessels are effective in removing chlorine, organic chemicals, tastes and odors, phenols, pesticides, detergents, micro-contaminants, halogenated organic compounds, hydrocarbons and other dispersed contaminants by a carbon “adsorption” process. They are designed to accomodate any flow rate and are easy to operate. Ecologix In-line Granular Activated Carbon filtration systems are designed for use where adsorption technology is required for contaminant removal. Our granular activated carbon filtration systems utilize the principles of adsorption for the removal of compounds too small for removal with multi-media filtration technology. These automatic systems are extremely effective in removing chlorine and chlorine related compounds, organic chemicals, tastes and odors, halogenated organic compounds, hydrocarbons and other highly dispersed contaminants. Through the use of automatically controlled backwashing, the filter will operate “on-line” for extended periods of time prior to the short backwashing cycle. Automatic filter operation is monitored on both elapsed as well as pressure differential. When the controller “calls” for a backwash as a result of pressure differential or elapsed time, the backwashing function utilizes a portion of the clean filtered water produced by the system to c lean the media. Single tank systems utilize unfiltered water for backwashing. 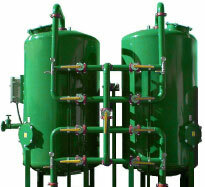 Optional external backwash water sourcing systems are available for both single and multiple tank systems. The use of granular activated carbon in removing substances from water streams is extremely successful through the adsorption properties of granular activated carbon media. With activated carbon’s strong affinity for impurity adsorption, water being processed with activated carbon must be pre-filtered utilizing sand media or multi-media filtration prior to contact with the carbon media to protect the carbon from premature fouling. Through the pre-filtration process suspended solids that tend to foul the porosity of activated carbon are eliminated, thus extending the useful life of the activated carbon media. During the adsorbtion process granular activated carbon provides micro-purification of water removing both micronic as well as sub-micronic materials. Our granular activated carbon filtration system utilizes a vertical side shell depth of 72″. These granular activated carbon filters feature Scotchkote 134 fusion bonded epoxy linings, cast iron or brass automatic valves, solid state automatic controls and type 304 stainless steel underdrains. Standard Ecologix systems are shipped assembled on structural steel skids for easy installation and start up. Standard inlet and outlet connections are flanged but may be ordered grooved as an option. 2472-1A 16-32 60 12.5 3.15 32 2 2 100 1750 510 513 3'1" x 2'4" x 9'0"
2472-2A 32-64 120 25 6.30 32 3 2 100 3450 975 1025 4'5" x 2'4" x 9'6"
2472-3A 48-94 180 37.5 9.45 32 3 2 100 5250 1480 1598 6'9" x 2'4" x 9'6"
3072-1A 25-50 90 19.5 4..91 49 3 3 100 2700 740 866 4'8" x 2'9" x 9'6"
3072-2A 50-100 180 39 9.82 49 4 2 100 5200 1260 1656 5'5" x 2'9" x 9'6"
3072-3A 75-150 270 58.5 14.73 49 4 2 100 7850 1920 2447 8'3" x 2'9" x 9'8"
3672-1A 35-70 135 28 7.10 71 3 3 100 3800 910 1262 4'8" x 3'3" x 9'10"
3672-2A 70-140 270 56 14.20 71 4 4 100 7400 1630 2449 6'5" x 3'3" x 10'3"
3672-3A 105-210 405 84 21.30 71 4 4 100 11300 2640 3636 9'9" x 3'3" x 10'3"
4872-1A 63-126 240 50 12.60 126 4 4 80 6700 1260 2200 5'7" x 4'3" x 10'10"
4872-2A 126-252 480 100 25.20 126 6 4 80 13450 2550 4325 8'5" x 4'3" x 11'2"
4872-3A 189-378 720 150 37.80 126 6 4 80 20150 3780 6450 12'9" x 4'3" x 11'2"
4872-4A 252-504 960 200 50.40 126 8 4 80 27300 5450 8650 17'1" x 4'3" x 11'2"
4872-5A 315-630 1200 250 63.00 126 10 4 80 33800 6500 10775 22'2" x 4'3" x 11'4"
4872-6A 378-756 1440 300 75.60 126 10 4 80 40500 7720 12900 26'6" x 4'3" x 11'2"
5472-1A 80-160 300 63.5 15.91 159 4 4 80 8350 1460 2817 5'10" x 4'9" x 11'4"
5472-2A 160-320 600 127 31.82 159 6 4 80 16750 2930 5633 9'4" x 4'9" x 11'8"
5472-3A 240-480 900 190.5 47.73 159 6 4 80 25150 4400 8675 14'2" x 4'9" x 11'8"
5472-4A 320-640 1200 254 63.64 159 8 4 80 33650 5970 11191 19'9" x 4'9" x 11'10"
5472-5A 400-800 1500 317.5 79.55 159 10 4 80 42100 7490 14008 24'7" x 4'9" x 11'8"
5472-6A 480-960 1800 381 95.46 159 10 4 80 50200 8690 16479 29'5" x 4'9" x 11'8"